Next fall, 531 students — and one faculty member — will have a new home. That’s when the UO’s new and currently unnamed residence hall on East 17th Avenue will officially open for business. The professor will live in the hall as the faculty-member-in-residence for one of the academic residential communities on the first floor of the new hall. The communities offer students with shared academic interests the chance to live together, take classes together and have a faculty advisor dedicated to guiding them through their freshman year. The academic residential communities in the new hall will be the Art and Design Community, partnered with UO’s School of Architecture and Allied Arts; Community for Social Activism, with the School of Law and Department of Philosophy; Media and Social Action, with the School of Journalism and Communication; and Native American and Indigenous Studies, with the Native and Indigenous Communities Program. 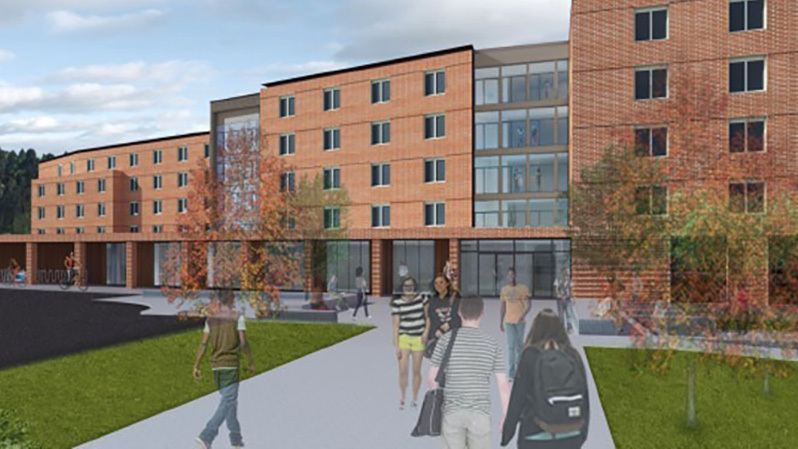 Currently, the Global Scholars Hall is the only residence hall with a faculty member in residence, but Bean Hall will also have one after its planned renovation. The goal is to place a faculty member in each residence hall as it is renovated. Anna Schmidt-MacKenzie, the UO’s director of residence life and educational initiatives, said academic residential communities, which evolved out of the freshman interest groups, have only existed in their current form about five years, and about a quarter of incoming freshmen participate. But for her, the more students in an academic community the better. The new residence hall’s opening coincides with the start of the UO’s new policy requiring all first-year students to live on campus. The UO is the last public university in Oregon to adopt such a policy, which will apply to students who don’t already live within a 30-mile radius of campus, with a few exceptions. According to a study done by UO’s Division of Student Life, students living on campus their first year have a 0.13 higher GPA on average than their peers living off campus. Griffel also said the new hall will be tailored to the modern-day student. He compares the design of the new residence hall to that of the Global Scholars Hall, where one set of main doors feeds into a central hub. The central entrance in the new hall will be flexible, with spaces designed to accommodate a variety of needs. “One of our challenges — and opportunities — was creating educational spaces that could be changed over time or customized by the faculty,” Schmidt-MacKenzie said. As for a name, Griffel said that’s in the works. But, he adds, if a big donor emerges, the naming is up to them. So if you have about $45 million lying around and want your name on a building, let him know.